Arrange squash halves in a large baking dish. Bake squash in preheated oven for 50-60 minutes, or until tender. Heat oil on medium in a large stockpot or sauce pan. Add onion and carrot and sweat, stirring occasionally, until onions are softening, 3-4 minutes. Scoop squash pulp from shells. Transfer vegetables to the stockpot or saucepan. Add apples, cooked quinoa, broth and water. Simmer covered 20 minutes or until apples and carrots are tender. Add thyme and pepper. 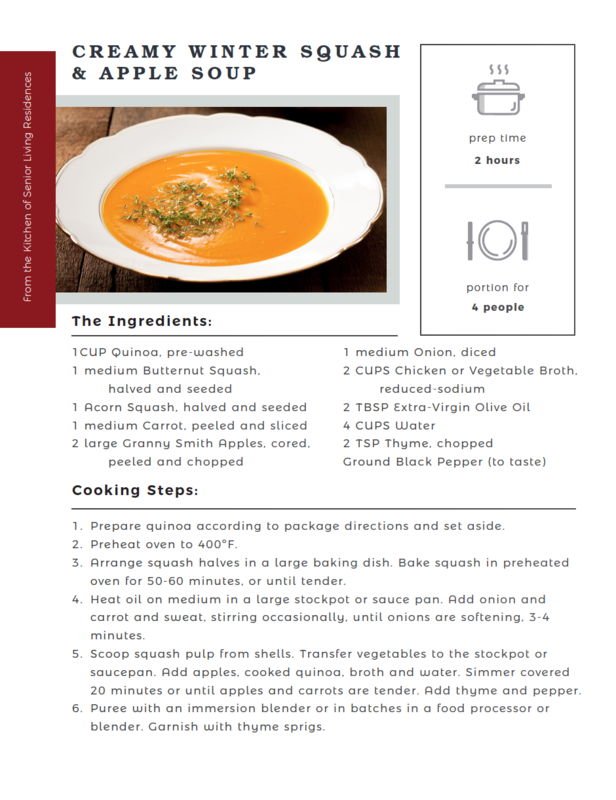 Puree with an immersion blender or in batches in a food processor or blender. Garnish with thyme sprigs.